I sat down and read the book Deuteronomy while waiting for, and while on board, a flight to Memphis this week. This project of reading whole books in one sitting gets easier and more exciting every time I do it. It makes me wonder why I haven’t read every book this way. 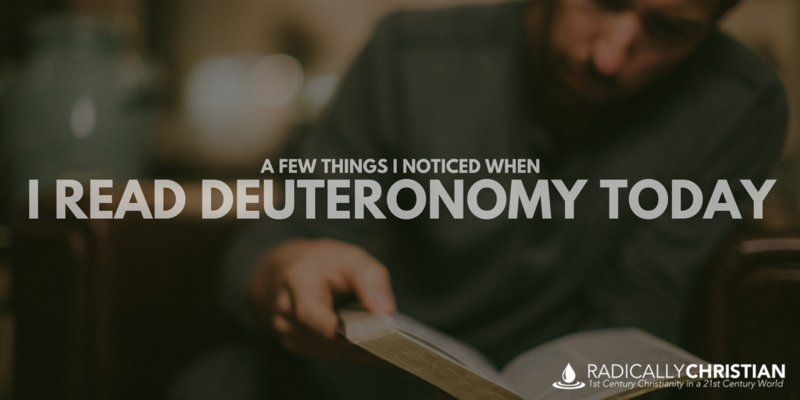 So let’s talk about Deuteronomy because there is some great stuff in this book! The people of Israel had wandered in the wilderness and now it was finally time to take possession of Canaan, which God had promised to their forefathers. But before they took possession, Moses reminded them of where they came from and how they were supposed to live as God’s delivered and sanctified people. 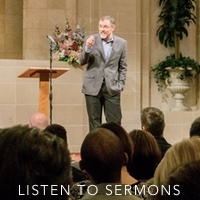 If you gloss over the book of Deuteronomy, or take a few passages out of context, you might think this is a book about works, “Do this and good things will happen, do that and bad things will happen.” But reading it that way really misses the big picture. Moses reminds Israel over and over, they don’t deserve to receive the land. They are receiving it as a gift because of God’s love for them and the promises He made to their forefathers. God is keeping the promises of His covenant with them, in spite of the fact that Israel has been nothing but stubborn and rebellious for the last forty years. Again, if we’re not careful we will read this story as saying the Promised Land would be their wages for obedience to the Law. But again, that misses the point. From the very beginning, Moses tells Israel that the purpose of their obedience was so that they might be a light to other nations. God wanted the Gentile nations to see Israel and say to themselves, “Surely this great nation is a wise and understanding people.” Israel’s obedience to the Torah of God was supposed to point the nations to the God of the Torah. As a kingdom, Israel was supposed to act as a priesthood to the other nations. They were supposed to reflect the glory of God into the world and be a blessing to the nations on behalf of God; so that the whole world might know the one true God. One of the primary aspects of the Law on which Deuteronomy focuses is caring for three special groups of people: the fatherless, widow, and immigrant. It was the job of every Israelite to provide for these people. In other civilizations, these groups might have been seen as a drag on the society; after all, they contribute little and cost much. But amongst God’s people, the fatherless, widow, and immigrant were to enjoy a favored status. They were to be cared for by the whole community. The land of Canaan is described as being a paradise. A place like the Garden of Eden. In fact, it’s almost as if Israel taking possession of the Promised Land is like the first group of humans returning from exile after the Fall in the Garden. But sadly, throughout the book, Israel’s own fall and their own coming exile are already imminent. Like Adam and Eve, like all humanity, Israel would inevitably fall and be exiled from God’s paradise. Their coming fall, however, would not stop God from fulfilling His promises. Someday in the distant future, after their fall and exile, they would be given the opportunity to repent of their sins, be forgiven, and dwell once again in the land. But this would only be possible through divine intervention; God would have to be the one to circumcise their hearts. Only after this great act of God, would they be able to fulfill the greatest commands of the Torah: loving God with all their heart, soul, and strength and loving their neighbor as themselves. In keeping with that promise, this is the Good News that was announced to the gathered people of Israel on the Day of Pentecost, “Repent and be baptized every one of you in the name of Jesus Christ for the forgiveness of your sins, and you will receive the gift of the Holy Spirit” (Acts 2:38). Through Jesus, Israel and the nations are all being delivered from exile. Sins are being forgiven. Our hearts are being changed so that we truly begin to love Him and love others. Someday soon our deliverance will be complete; sin and death will be no more and we will “eat of the tree of life, which is in the paradise of God” (Revelation 2:7). Until then, let us be what Jesus was and what Israel was called to be, a royal priesthood whose faithfulness points the nations to our God. P.S. If you missed my thoughts on Genesis, Exodus, Leviticus, or Numbers, you can go back and read those posts.